Choosing gifts for women is always easier than picking gifts for men, I feel. The reason being that there is more choice for ladies and as a woman I would know what other ladies would love. However that is not the case when it comes to men and picking gifts for them is always harder. With Christmas not far away, I have been looking at various online gift websites to get some ideas on the 'perfect' Christmas gift for the men in my life. I have looked at the usual choices like video games, wallets, Swiss knife, tools, accessories, clothes, books and collectibles. After having looked at all these traditional gift ideas and not happy with any of them, I turned my attention to quirky or unusual gifts - something that would be funky and fun. And it was during this search that I came across the Knuckle Duster Mug on IWOOT. As I laid my eyes on this mug, I knew that this would make a wonderful gift for one of the men in my life - Mr. H. He enjoys his tea a lot and this mug made with high quality porcelain and finished with hard-wearing titanium would be perfect for him. The mug is the perfect size for a hot cuppa, is easy to hold, sturdy yet not very heavy and is definitely a conversation starter. An unusual and useful gift - the mug brought a smile on Mr. H's face. 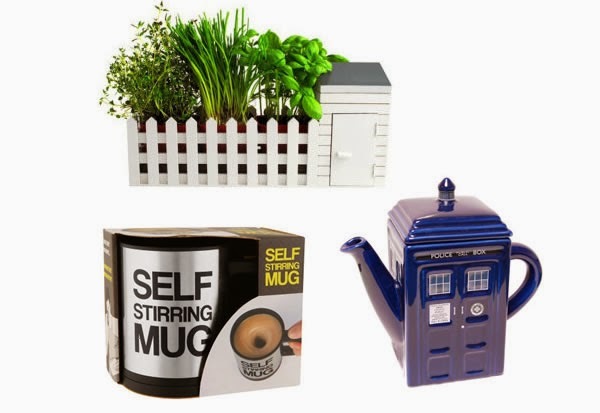 Some of the other unusual gifts that I liked on IWOOT are: the self stir mug and the Dr Who Tardis tea pot. How cute is that tea pot? The miniature indoor allotment also caught my fancy. Love it. This would make a wonderful gift to someone who is green fingered. IWOOT have a lot of other cool and quirky gifts that would make perfect Secret Santa gifts or Stocking fillers. So, if you are stuck for ideas on what to gift the men in your life, then I suggest that you take a look at IWOOT. I am sure you will find something interesting on the website.